It’s something you really don’t think about. Not really. You’re totally in love with your husband/wife to be, and can’t wait until the wedding day. As well you should. Because marriage is supposed to be forever. Forever with the love of your life. And with his/her family. 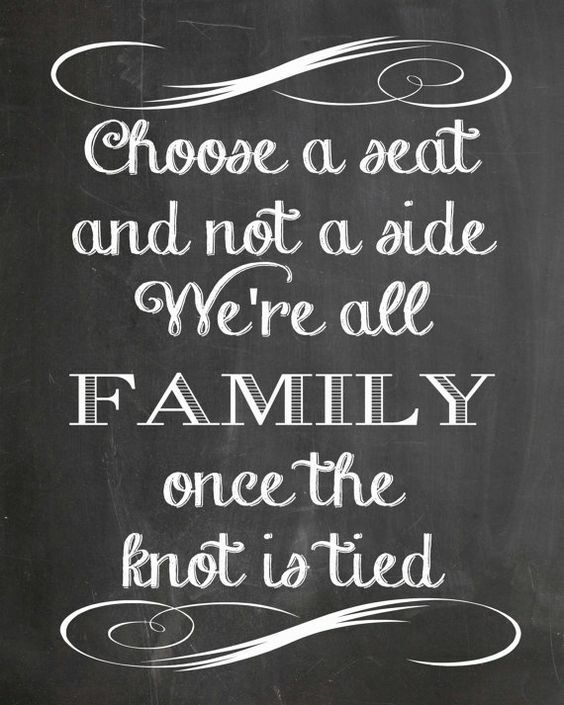 That includes parents, brothers, sisters, aunts, uncles, cousins…the whole family tree. Because now they’re your family as well. In an ideal world, that new family tree is great! It’s strong, and its branches are ready to support a lot of new growth. Branches that are grafted on are quickly accepted and grow along with the other branches, just as if they’d always been part of that tree, blending in perfectly. That’s in a perfect world. And sometimes that perfect world exists. But a lot of the time it really doesn’t. Because there are too many branches that don’t want new growth. Or new ideas. They don’t want to accept anyone new because they don’t want to change the family tree. It’s been good to them for a long time, so why mess things up by grafting on new branches? Now before you start getting offended by this writing, let me make one important point. This is NOT written about any one family, or any one person. I’m not perfect, and neither are you. My family’s not perfect and neither is yours. But I wouldn’t have them any other way. However…. In the beginning of a new relationship, his/her family is usually excited to meet you. You’re a bit nervous, because you want them to like you. And they usually do, or seem to, at least at first. But many times, the more you get to know them, and the more they get to know you, well, you find there are a lot of branches on that tree you’d really like to trim away. And you eventually realize they’d probably like to do the same with you! Every family goes through this. There are no perfect family/in-law relationships. At least none that I know of. There’s usually at least one person that wants to make your life difficult because they just don’t like you, or maybe they’re jealous of you. And there’s nothing you can do to win them over. Sure, you try, but nothing changes. Did you know they say the same thing about you? Of course they do. Everything’s your fault. Just like to you, it’s all their fault. And sometimes that’s actually true. Sometimes it’s one or two family members who just like to cause trouble because they want to be the most important branch on the tree, and they want everyone to know it. And you represent a change they don’t like. Or you don’t like them for whatever reason, and you let them know it by your actions. There’s not much, unfortunately, that you can do to change it. Any more than they can change you. Just be sure you’re not the one who’s trying to change everyone else and make them conform to your ideas and your way of doing everything. That doesn’t work either. Because all families are unique. They have their own dynamics, their own idiosyncrasies, their own traditions and outlook on life. His/her family is no different from yours in that respect. And let’s be honest; your family isn’t perfect, and they don’t always get along with everyone either. Do they? And what does your family really think of him/her? I have no answers for solving this age-old problem. It’s been around forever, and unfortunately will continue to be. Why? Because we’re all unique. We all have our own likes and dislikes, our own ideas of who we want as friends. We get offended at things people say and do that hurt us, and sometimes we can’t get past it. Because either we’re too proud to try, or the other person won’t try. Just remember, it’s his/her family and you’re now a part of it, too, or will be soon. Make yourself the strong branch to be grafted on that tree. And if the tree doesn’t accept you, as long as you’ve done your part, there’s nothing more you can do. Except start a new tree with your new spouse. Plant it close to theirs, but realize it’s now got to stand on its own, rooted in good fertile soil and nourished by love. And one day, just maybe, a few of the branches on that older tree may finally want to be grafted on to yours.